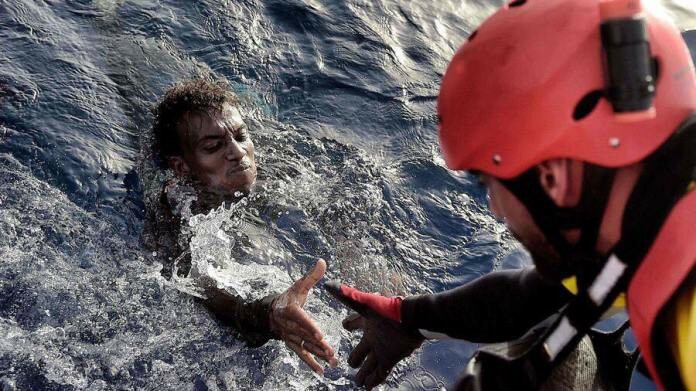 Rescue in the Mediterranean Sea.– Photo: © Proactiva Open Arms. The Mediterranean is a lethal route. Of the almost one hundred thousand migrants who arrived in Europe between January and November of 2018, 46% have done so through Spain, eight times more than the arrivals in Italy and three times more than in Greece this year. And these are the ones that arrive. Along the way, a trail of deaths and disappearances. The UNHCR data are conclusive: so far this year, 1,600 people have died or disappeared while trying to reach Europe, 1,500 of them lost their lives in the Mediterranean, and Spain has accounted for much of the tragedy. The IOM Missing Migrants Project documented until October 21 the deaths of 1,857 migrants, 42 of them children. Lives that were left in the course of the waters between North Africa and Sicily. They are not the only ones. Missing Migrants has also documented that two people died in mid-October when they tried to jump over a fence between the Moroccan province of Nador and the Spanish enclave of Melilla: “(…) Barbed wires that were on top of the mentioned fence Six meters high, several people were injured trying to jump on Sunday, October 21. The body of a young man from sub-Saharan Africa was found on the Spanish side of the border, while local NGOs reported that another man lost life in the Nador hospital due to the injuries suffered “, are some of the testimonies collected by the IOM in the Spanish strip of clandestine land migration. The face of clandestine migration is tragedy, but if there is one that breaks all the schemes that is, without doubt, that of the minors. And if they arrive alone, the drama places us in the antechamber of hell. “Unaccompanied minors”, MENA, in the official nomenclature of the EU, to make it more bearable, as an ointment for burns. The harsh reality is that they are children with no cover except their courage. Alone of solemnity. They leave behind a continent where present, past and future are proposed as a continuity braid. Many of those arriving by sea embarked in these boats of ignominy their own families who see in them the only opportunity to try a future, to provide them with a life expectancy or to save them from death or exploitation networks all types. They travel alone, and when they arrive, another new solitude begins: the confinement in centers under the protection of laws that preserve their image and protect their privacy behind a wall -the Government of the Canary Islands has recently opted for military installations-, which prevents us from knowing who they are. , why they risked their lives alone, what a dream or what yoke pushed them to cross a stormy ocean. This coin has another face. And it is not better. In 2017, the Spanish Refugee Aid Committee (CEAR) denounced that, more and more, on the Spanish borders it is the police who decide to apply or not the presumption of minority to unaccompanied minors who request asylum. The Office of the Ombudsman picked up the glove to remind the Government that not applying the presumption of minority is breaching national and international legal obligations. The truth is that, when the Office of the Public Prosecutor for Minors assumes the criteria of border control agents without carrying out specialized interviews to detect whether or not they are minors, these children and adolescents are treated as migrant adults, that is, they are returned. at the border to the place of origin or their asylum application is processed and enter Spanish territory as adults. Again alone and on the street. Rapid identification and protection upon arrival: A person responsible for the protection of minors must be present from the first moments of the registration phase and in all reception facilities that house minors, and child protection agents must be designated in each case. critical point. Member States should implement the necessary protocols for the reporting of all cases of missing children and the exchange of information in this regard. Adequate conditions for the reception of minors: Upon arrival, the needs of each child should be determined as soon as possible. All of them must have access to legal and health assistance, psychosocial support and education without delay and regardless of their status. Unaccompanied minors should be offered the possibility of being placed in foster homes or families. Children must be given alternative solutions to administrative detention. Rapid determination of the statute and effective guardianship systems: The role of tutors of unaccompanied minors needs to be strengthened. The Commission will create a European tutelary network that exchanges best practices. Durable solutions and early integration measures: The Commission will also promote the integration of children through funding and through the exchange of good practices. The Member States are urged to speed up the resettlement of children in need of protection and to ensure the implementation of measures to locate families and reintegrate children who will be returned. Fight against the root causes and protection of children on migratory routes outside the EU: Efforts must be redoubled to help partner countries to strengthen their national systems for the protection of minors and to prevent the trafficking of children. It is also necessary to carry out a timely follow-up of the recently revised EU guidelines for the promotion and protection of children’s rights, also in the countries of origin and transit. The measures that are set out should be subject to diligent, concerted and coordinated supervision at the EU, national, regional and local levels. The Commission will monitor this process closely, report regularly to the Council and the European Parliament. Most of the applicants for protection in Spain initiate the procedures in the detention centers for foreign affairs in which they are detained with a view to being expelled. In 2017, more than 100,000 people applied for asylum in France, 17% more than the previous year, and another 85,000 were rejected at the country’s border. The new law was approved last year by the Government of Ennmanuel Macron on the premise of favoring “controlled immigration and an effective right to asylum.” The Law reduces the average time to process asylum requests from fourteen to six months and the margin to present an appeal to two weeks. The text increases the retention period for migrants in the process of expulsion from 45 to 90 days, and increases retention time from sixteen to twenty-four hours until their documentation is verified. It includes fines and years of prison for those who carry a false document to stay in the country. The new Migration Law provoked a fiery debate in the Parliament of France, even among the ranks of those who support the Macron government, -a conglomeration of right and left deputies-, who broke their unity before a Law qualified from the Social Democratic caucus as a “strategy of fear” because it assimilates, they say, clandestine migration, terrorism and crime. “The Spanish president and the French head of state are promoting a common response that includes the creation of ‘closed centers’ in the EU where to decide if newcomers can qualify for refugee status or should be expelled.” This is how the Spanish and French press summed up the meeting last June between Macron and Sánchez about the migration crisis. A tune that proposes a Franco-Spanish axis assisted by Germany and that could be attractive, according to both leaders, to attract Italy towards a European solution. The Italian government, led by Giuseppe Conte, was formed last June thanks to the pact between the Five Star Movement (M5E) and the extreme right-wing Northern League, and heads the anti-immigration front of the European Union. A fracture that divides the European Union into two blocks: the supporters of greater European integration, led by France, and the eurosceptics and populists, who have in Italy the iron hand contrary to integrate migratory flows. The policy of immigration and asylum has entered the agenda of the Union as a great challenge. While the EU is tightening its migratory policies, Portugal began applying this past month a new package of measures aimed at regularizing migrants, even if they entered the country irregularly and without a visa. The government of socialist Antonio Costa seeks to regularize those who have “at least one year” residing Portuguese soil, ie, about 30,000 people. To receive the residence permit, the new Portuguese regulations do not require documentation proving legal entry to the country, and that is attributed urgently “for humanitarian reasons, for carrying out activities of common interest, scientific and / or cultural.” Portugal rows against the current. Meanwhile, this Monday, November 19, the president of Spain, Pedro Sanchez, made his first official trip to Morocco and communicated to the prime minister, Saadedín Al Othmani, and King Mohamed VI, that it is Spain’s desire to organize the World Cup. of 2030 by the hand of Portugal and Morocco. The idea of ​​the three-way World Cup was raised by FIFA President Luis Rubiales, in a meeting with Pedro Sánchez last September, and, according to the Spanish Government, has been very well received by the Moroccan authorities. Russia, organizer of the 2018 World Cup, obtained 11,800 million euros of benefits, 1% of its total public investments. In addition, while the European Union is divided into two camps that discuss whether to toughen more or less the Laws on Migration, the French national football team has among its 23 players to 19 of migrant descent. But they are not perceived as migrants. They are not poor at the borders. The Canary Islands have received 949 immigrants arriving at their coasts in small boats or canoes so far this year, six times more than in the same period of 2017, when they counted 151. According to data of the Ministry of the Interior to October 15, from 1 from January to October 15, the coasts of the archipelago reached or 48 vessels with irregular immigrants were rescued in their area of ​​influence, four times the year before (12). On the same dates the number of irregular migrants by sea and land for the total of Spain reached 48,669, compared to 19,134 who did it in the same period last year, 154% more. Most of the immigrants arrived in Patera, 43,467, a figure that is far from that of last year, when 14,195 arrived, representing an increase of 206%. The total number of boats with immigrants that have arrived in Spain between January and mid-October has been 1,636, compared to 851 the previous year. With these data it is reflected that the number of immigrants continues to increase and leaves behind the figure of 2006, when the so-called crisis of the cayucos left alone in the Canaries almost 32,000 people. Unaccompanied minors. With data updated to November 2018, there are 339 unaccompanied migrant minors in the Canary Islands, of whom 80 are still without proof to determine their age. Each Cabildo will host a quota of 400 unaccompanied minors. The Canarian Government bets for the distribution between autonomous communities and for the return. Clear alignment with the guidelines set by the Spanish president, Pedro Sánchez. Stéphane Dujarric, spokesman for the United Nations, said at the end of August that, due to the crisis in Venezuela, 2.3 million people had left the country, mainly in the direction of their neighbors (7.2% of the population of the country). It is the largest migratory movement in Latin America. Información cosmopolita desde ultramar. Cosmopolitan news from overseas.